Suresh S. Ramalingam, MD, professor of hematology and medical oncology, has been named the new co-leader of the Discovery and Developmental Therapeutics (DDT) program at Winship Cancer Institute of Emory University. The DDT program aims to facilitate molecular target-based cancer drug discovery, biomedical technology and clinical trials for therapeutic development. 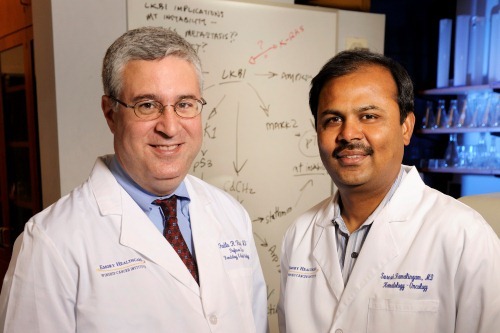 Ramalingam takes the place of Fadlo R. Khuri, MD, deputy director of Winship and professor and chair of the Department of Hematology and Medical Oncology. Khuri, a founding leader of DDT, served in this role for 12 years. Ramalingam will join Haian Fu, PhD, director of the Emory Chemical Biology Discovery Center, in co-leading the DDT program. Walter J. Curran, Jr, MD, Winship executive director states "Dr. Ramalingam’s pivotal national role as chair of ECOG-ACRIN's Thoracic Committee and his leadership in successfully competing for two large NCI U10 grants position places Winship, and DDT specifically at the cutting edge for translating new therapies for cancer into the clinic. His expertise in drug development meshes perfectly with Dr. Fu's expertise in chemical biology and drug discovery." Khuri says, "I am delighted that Dr. Ramalingam, one of the preeminent leaders in thoracic oncology and developmental therapeutics, will take on this critical leadership role within Winship. This is an exciting time of growth and expansion for our cancer center. As I turn my attention to the continued growth and development of all four Winship research programs, I know that DDT will flourish under the dynamic leadership of Drs. Fu and Ramalingam." Members of the DDT team work collaboratively on the next generation of anti-cancer innovations and help move these advances from the lab to the clinic. The program includes basic scientists who identify new anticancer targets, translational researchers who refine these discoveries for clinical application, and physicians who treat patients with promising new cancer therapies and techniques.